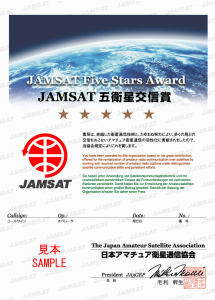 On behalf of the JAMSAT(Japan-AMSAT) board, it is my great honor to draw your attention to our brand new award, named JAMSAT Five Stars Award. 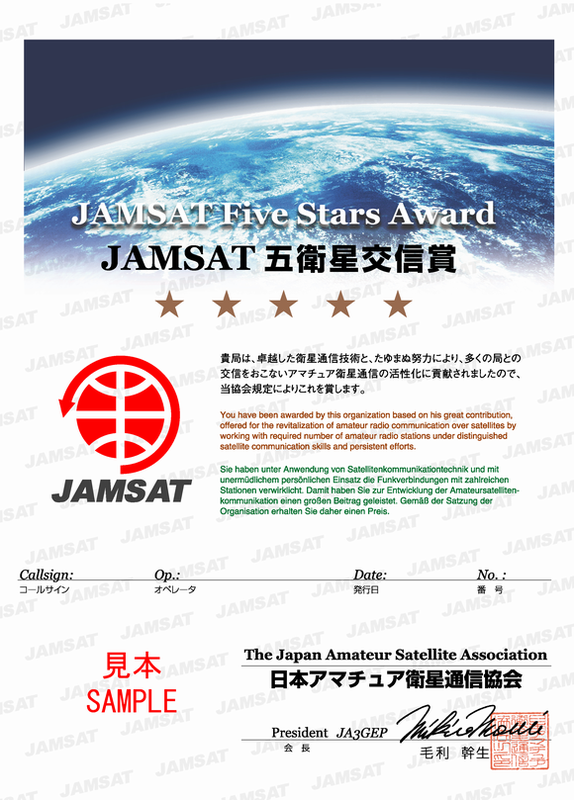 Issuing of this award is intended to get more higher activity of radio amateur communication over satellites and eventually to have more fellows in this field and protect the frequency allocation given to the amateur satellites use. b.One specific satellite is counted once, even the QSO was made on different mode or band on the same satellite. c.Valid only 2way QSOs. Cross mode QSOs are not valid on this award. d.The QSOs using Digital mode and SSTV are valid, however you are requested to get QSL Cards. e.No specific endosement (eg. CW, SSB) is provided. f.QSL is accepted by traditional paper QSL card. In addition to it, electric QSL with used satellite information, such as eQSL.cc and LoTW can be accepted. g.All QSO within valid license condition are accepted. QSOs made after the January 1st, 2006 00:00 UTC are valid. From abroad, Ten(10) “NEW” IRCs should be sent with the application form if you request to send via air mail. No Fee if you accept via sea mail. For the domestic application, 5 82JPN Stamp should be remited by Postal Money Order. If you are member of the JAMSAT, then free of charge. If you have had any query, please send your message by e-mail.